1. Focus on your higher-value cards. Always try to use your more valuable letters and especially any ‘rare’ letters (eg. J, Q, V, X, Z ...etc). But be ready to discard a high-scorer if it doesn’t seem to work with the rest of your hand, because it will count against you if you get caught with it and can’t use it. Basically the high-value letters are good, but only IF you can use them. 2. Give yourself options. At the beginning of a round your seven consonants will hopefully give you some word ideas. 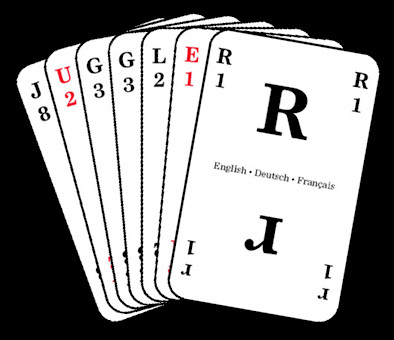 For your first couple of turns you will usually pick up vowels. This should help you to see where your hand is going, so you can decide which cards are better to discard. Remember you don’t have to discard anything; increasing the size of your hand may give you more choices next turn. Bear in mind that the lower-value letters are very useful for word building, and won’t cost you many points if you don’t use them. 3. Play with what you have rather than what you’d like to have. Don’t get stuck on one word idea and hold out for a particular letter - always be looking for other word possibilities in your hand. Juggling your letters can often help to give you new ideas - and you may even find that some of your consonants go together better than you first thought. It is generally not worth drawing from the black deck, because you are unlikely to get a consonant you want; much better to adjust your thinking around the letters available on the table. 4. Short words can be deadly! Also remember that you don’t need to pick up a card. If you already have a decent-scoring shorter word, you could just discard your other cards (one card per turn) and then declare with the short word. the other players for several negative points. The JUGGLER hand pictured above totals 20 points. Sorry - there are no bonus points for spelling JUGGLER!